England will renew their rivalry with New Zealand in the second of the Quilter Internationals at Twickenham on Saturday, live on Sky Sports..
Few international match-ups command attention like England versus New Zealand and the four-year wait since the most recent instalment has only served to whet our collective appetite even more. These two giants of the sport have served up many memorable matches - including some thrilling encounters at Twickenham which will also host their latest showdown. Take a trip down memory lane with five of those great matches in south west London. New Zealand arrived on an unbeaten run of 20 Test matches, and with their 2011 Rugby World Cup triumph still fresh in the memory, but they were swept aside by an England side that produced arguably their greatest Twickenham performance. Owen Farrell kicked England into a 15-0 lead only for the All Blacks to battle their way back into the contest with tries from Julian Savea and Kieran Read. 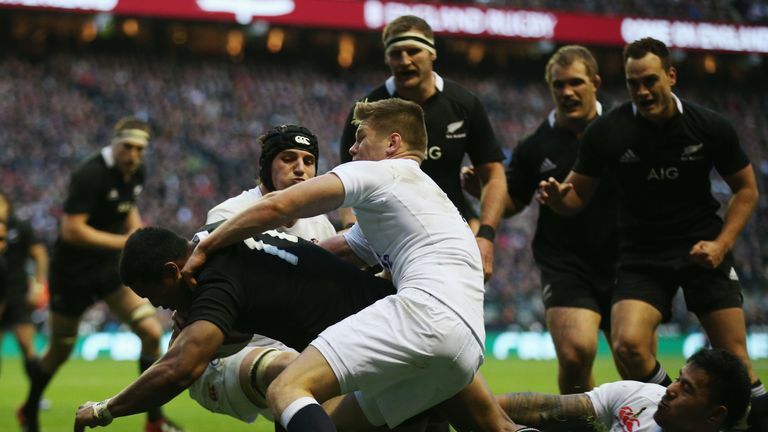 Watch England end New Zealand's 20-game unbeaten run with a sensational 38-21 victory in 2012. England took control once again with a try from Brad Barritt before Manu Tuilagi carved an opening for Chris Ashton to touch down. Tuilagi continued as tormentor-in-chief with a try of his own shortly after and a second try for Savea proved no more than a consolation. "The win gives the players belief in the direction we are going and the rugby public a sense that this journey is the right one," said head coach Stuart Lancaster after what was the undoubted highlight of his tenure. The All Blacks were once again in formidable form coming into this clash having won 11 straight games including a 25-8 victory over England at Old Trafford just a fortnight before. England did not dwell on that recent loss with Lawrence Dallaglio, Richard Hill and David Rees all crossing in the first half to help the hosts to a commanding 23-9 lead. But back came New Zealand with tries from Walter Little and Andrew Mehrtens, who also kicked 16 points, taking them into a narrow lead as the game neared its conclusion. England would then rally themselves with a Paul Grayson penalty ensuring a thrilling battle would end in the only draw ever recorded between the two sides. 'The Invincibles' swept through the UK, Ireland, France and Canada during 1924-25 on an incredible 32-game winning run that included Test victories over Ireland, England, Wales and France. The win against England at Twickenham also produced the first sending off in Test rugby when the All Blacks' Cyril Brownlie was dismissed by Welsh referee Albert Freethy after just eight minutes for reportedly kicking one of his English rivals. The tourists shrugged off the setback and went on to claim the win thanks largely to tries from Maurice Brownlie, Jim Parker, Jack Steel and Snowy Svenson. We would have to wait until 1967 for the next Test match dismissal when New Zealand's Colin Meads walked during his side's clash with Scotland at Murrayfield. In 2005, New Zealand completed their first Grand Slam tour of the UK and Ireland since 1978 and only their second ever clean sweep. England came closest to derailing the All Blacks with a Martin Corry try giving them an early advantage. But back came the visitors with Dan Carter and Tana Umaga combining for their first score. Carter was central to proceedings again after the break with his game-breaking ability laying the platform for a Keven Mealamu try. The boot of Charlie Hodgson kept England in the contest and New Zealand's Tony Woodcock, Neemia Tialata and Chris Masoe were all sin-binned as the home side turned the screw but there would be no final twist in the tale. Chasing their second Grand Slam tour in just three years, the All Blacks proved too strong for Martin Johnson's side. England's indiscipline would prove their undoing with Lee Mears, James Haskell, Toby Flood and Tom Rees all spending time in the sin-bin during the game. The boot of Dan Carter punished the home side and carried the All Blacks into a 12-3 lead at half-time. England only flirted with a comeback in the second period before two tries from Mils Muliaina took the game out of reach with a superb break from Mealamu and try from Ma'a Nonu setting the seal on the win. New Zealand captain Richie McCaw lifted the inaugural Hillary Shield, named after the mountaineer who made the first successful ascent of Everest in 1953. Incredibly, the All Blacks did not concede a single try in their victories over Scotland, Ireland, Wales and England.